Another win for Puritan Medical Products – New US HydraFlock Patent Sets American Manufacturer apart from overseas competitor. The HydraFlock® swab is our high-performance product and our manufacturing process is unlike any other. 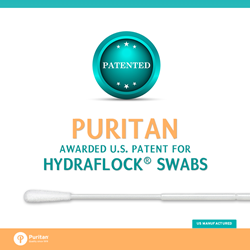 Puritan Medical Products Co., LLC, an American manufacturer of single-use medical, diagnostic, forensic and critical environment products for the global market, was awarded another United States patent, issued today, for its high-performance HydraFlock® swab. Puritan’s latest U.S. Patent 9,279,747 covers the HydraFlock® and related products, as well as methods of manufacturing and methods of using the products. Puritan’s previous U.S. Patent 8,334,134 covers additional aspects of the HydraFlock® product itself as well as for the unique manufacturing method involved. Puritan’s HydraFlock® swab produces superior sample collection, rapid elution, and increased test sensitivity by combining a unique microstructure with innovative fibers. Puritan has also been awarded patents in Australia, Canada, China, France, Germany, Hong Kong, Italy, Japan, Spain and the United Kingdom that cover related products and methods. Patents for additional aspects of the HydraFlock® swab technology are pending in the U.S. and elsewhere. Puritan Medical Products has expanded rapidly over the last few years, as a direct result of the company’s effort to meet the evolving needs of the healthcare, forensic, critical environment, food safety, and drug manufacturing industries. Puritan now manufactures more than 40 types of swabs, media transport systems, and other specimen collection devices including the PurFlock® and HydraFlock® swabs, both manufactured in Guilford, Maine by American workers. Puritan Medical Products Co., LLC is North America’s largest manufacturer of single-use medical products and diagnostic products. All Puritan products are manufactured at their Guilford, Maine, U.S. facility, which includes custom media manufacturing and compounding capability to meet a multitude of customer needs. Puritan operates a state-of-the-art microbiology laboratory that conforms to stringent U.S. quality system regulations. This lab is where all Puritan’s research and development as well as product testing, approval, and release take place.